For Immediate Release: July 16, 2017 4 p.m.
MENAN, Idaho – Investigators determined the July 15th North Butte Fire was caused by shooters illegally using exploding targets. The North Butte Fire burned 827 acres and will be contained today at 8 p.m.
Exploding targets are a binary explosive. A binary explosive consists of two components that are mixed together to cause a reaction. An exploding target usually consists of ammonium nitrate, the fuel, and aluminum powder, the catalyst. To set off an explosion, the mixture needs energy, which comes from the kinetic energy of a fast-moving bullet. When a bullet hits the mixture a loud bang and puff of smoke occur and heat is given off. The heat produced by the reaction can then spark a wildfire. Shoot responsibly! Using exploding targets on BLM lands is a misdemeanor and violators could be liable for costs associated with fire suppression, rehabilitation and property damage. · Choose a shooting area that is clear of dry grass/vegetation and rocks. · Always bring water, a fire extinguisher, and a shovel. · Discharging a firearm using incendiary, steel core or tracer ammunition is prohibited on BLM lands from May 10th to October 20th. 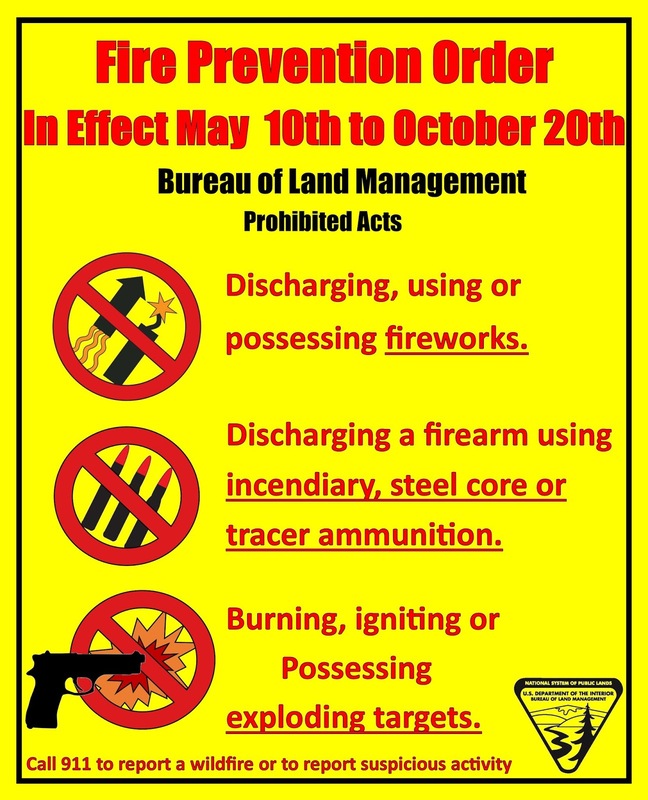 · Burning, igniting or causing to burn explosive material, including exploding targets is prohibited on BLM lands from May 10th to October 20th.